This Nike product is meant for knee protection against knee damages during sports such as volleyball or other similar sports which are related with frequent falling on the ground or contact with different surfaces. As volleyball is the game which is connected with constant digging and diving, the risk of knee injuries such as bumps and bruises is quit high, therefore, usage of knee pads is not only recommended, but also necessary. These Nike knee pads are low profile pads, therefore, they are not only lightweight and slim fitting, but also nonrestrictive and flexible which are important properties for competitions which require speed and agility. This product has a feature which is called Dri-FIT fabrication – it has extra soft interior lining, which is wicking sweat away, thereby helping sportsmen to stay dry and cool, despite the intensity of the game. Dryness and coolness is provided by ventilation zones at back of the knee as well. These knee pads have high density contoured foam padding which absorbs shock from different impacts and resists attrition during the game. Contoured foam construction also ensures a natural and unrestricted range of motion and thus flexibility and comfort. In one word, these Nike volleyball knee pads are not only protective, but comfortable as well. 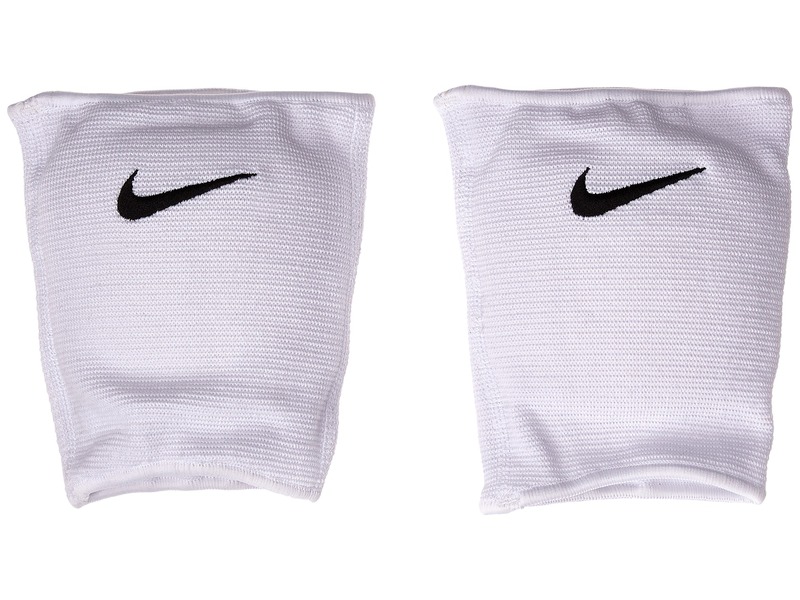 These Nike Essentials Volleyball Knee Pads are available in black and white color. They are low profile knee pads, therefore, they are short and slim. Taken as a whole these volleyball knee pads have minimalism style – they have no surplus design elements, but only practical functions. These Nike pads have black or white Nike logo on top. These Nike Essentials Volleyball Knee Pads are meant for knee protection against knee damages during sports such as volleyball or other similar sports which are connected with frequent falling on the ground. This product contains 36% of nylon, 21% of thermoplastic, 20% of polyester, 12% of spandex and 11% of silicone. These Nike knee pads are available in three different sizes – XS/S, M/L, XL/XXL – so they are suitable for adults and youngsters. This product owns features such as low profile, lightness, Dri-FIT knit construction, ventilation zones and contoured foam padding. You can get them in black or white color, and two of them, because usually they are sold in pairs. These knee pads are machine washable.